Be the Peter Parker of popups. Image via Shutterstock. 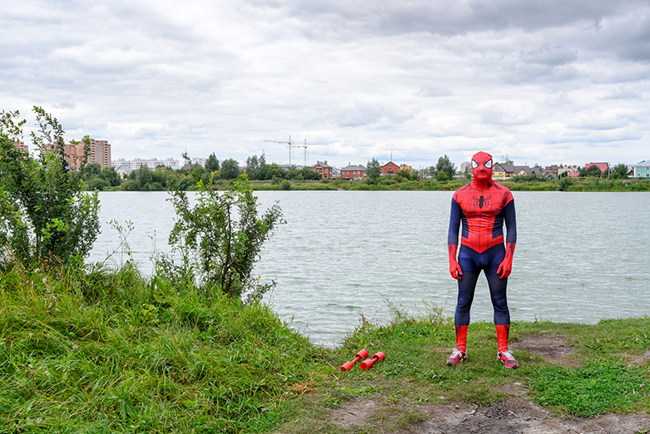 You’ve heard it before: “With great power comes great responsibility. And while Uncle Ben wasn’t explicitly referring to popups when he said these iconic words to Peter Parker, the same could be said about these handy little conversion tools. Popups are powerful not only because they are incredibly effective at snagging conversions, but also because they are so quick to launch. This combination of power and speed means it’s dangerously easy to launch one without much consideration for user experience. Thus, they’ve developed a bit of a reputation for being effective… and disruptive. But the disruptive nature of popups is actually inherent to their effectiveness, because it focuses the visitor’s attention on a single offer. They eliminate the paradox of choice and present the visitor with a simple yes or no question. However, there are ways to ensure the popups you launch both achieve your goals and provide value to your visitors. 1. Why are you launching a popup? Popups are most commonly used to accomplish one of three marketing goals: revenue generation, lead generation or traffic shaping. Do you want to build your blog subscriber list? Divert traffic to your pricing page? Entice visitors to make a purchase? This is what you need to figure out before you even consider building your popup. 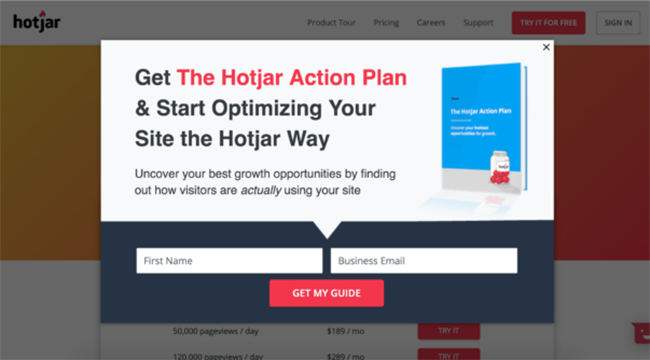 Hotjar’s premier popup built with Unbounce popups. If you don’t have a good answer to the “Why” question though, just stop. 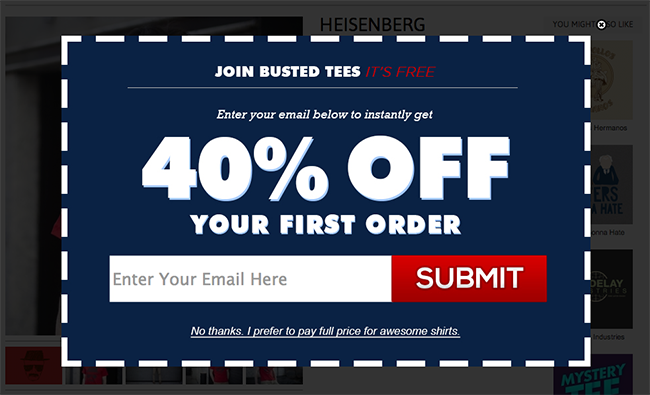 Popups, when used irresponsibly, can be intrusive and annoying. So if you don’t have a solid, strategic reason for launching one, hold on until you do. Your reason for running a popup might be lead gen, rev gen or traffic shaping (or maybe something completely unique), but just make sure you have one — plain and simple. 2. Where will you place your popup? Popups offer a reliable way to fill gaps in your funnel, but you need to figure out where those gaps may be. The easiest way to do this is to visit Google Analytics to determine your highest-traffic pages. Then whittle down the list to only include pages that don’t have a clear call to action — these pages are the low-hanging fruit you can start with to see immediate results. You should have already determined what the goal of your popup is; the diagram below will help you decide which of the CTA-free pages pair best with the type of popup you’d like to launch. 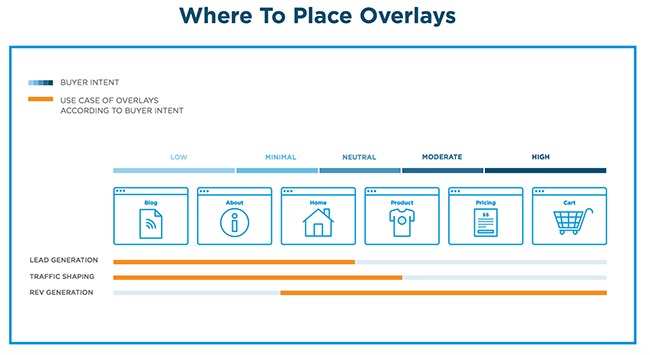 As you can see, different pages are associated with different levels of buyer intent, and so while a lead gen popup might perform well on your blog, a rev gen popup probably won’t. Tina star gif via Giphy. But I also challenge you to consider how you might use popups on your highest-traffic pages to get even better results (because even though you have a CTA, it doesn’t mean people see it). 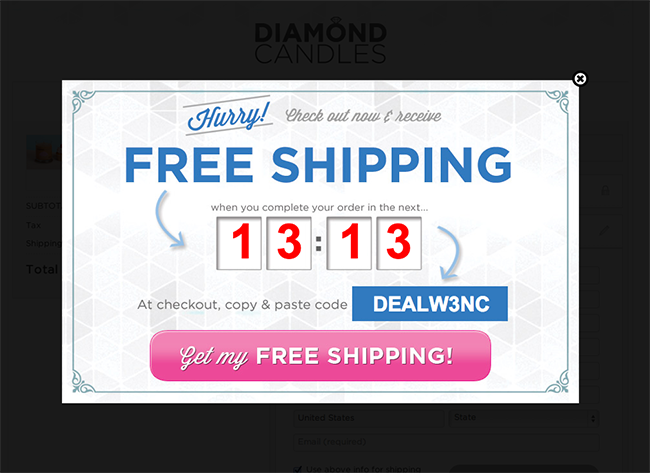 Adding a popup with a complementary offer to your main on-page offer can help bolster the success of your page, because popups leverage the psychological principle of pattern interruption to focus the visitor’s attention on a single offer. Your sidebar CTA, on the other hand, can start to blend into the page, so people become blind to it. 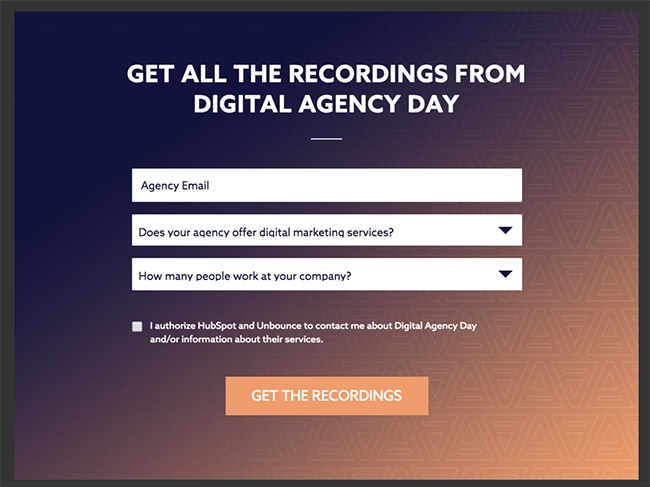 Whereas the signup page’s goal was to get people to attend the digital event, this popup offered exiting visitors the opportunity to simply get the recordings, even if they couldn’t attend. The results were some of the best we’ve ever seen: 1,991 full-form conversions on 10,005 views. 3. Who should see your popup? The key to high-converting popups is presenting compelling offers that (1) align with the visitor’s buying intent and (2) are relevant to that visitor’s specific needs or interests. This means targeting, and the more granular you can get the better. The first thing you want to find out is where your visitors are coming from. 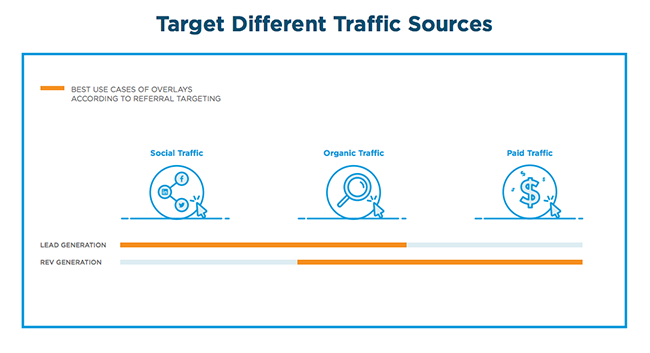 If you know that, you can better judge what type of popup should be presented, because different types of traffic relate to different levels of buyer intent (social traffic, for example, is often less likely to make a purchase than paid traffic). The following chart further illustrates this. Different traffic sources pair better with specific types of popups. Another thing you want to think about is whether the traffic consists of first-time or returning visitors, and — if they are a returning visitor — whether or not they’ve already opted in. Chances are, your page traffic is a mixture of different referral sources and visitor types, so it can be tricky to present an offer that’s relevant to everyone. Fortunately, Unbounce popups recently launched referral and cookie targeting, so you can present more relevant offers by customizing the popups visitors see based on where they’re coming from or what pages they’ve visited before. 4. What is your popup offer? By now, you should be seeing a trend — that creating an effective popup means keeping the visitor experience at the forefront of your mind. And the sweet spot is where your marketing goals align with the goals of the user: you want the sale, they want the bargain; you want the email, they want the ebook; and so on. So when you consider what your actual offer will be, ask yourself if your popup is valuable and relevant to your visitor. If it’s not both of these things things, your results will suffer and you risk being obnoxious. Another thing to consider when deciding on your offer is whether or not it’s relevant to your audience. And, might I point out, the above popup is also an incredibly valuable offer — $650 savings? Yes please! 5. When should your visitors see your popup? We’ve sorted where your popup should be seen and by whom, but there’s a final piece in the puzzle: When. 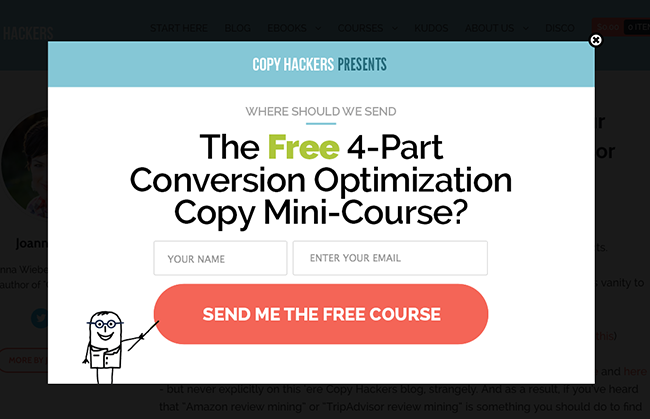 You have a few options around when to trigger your popup, and depending on the type of offer you’re presenting, different triggers may be more effective than others. On-arrival popups appear when your page first loads. Use this trigger for offers you want users to immediately see (e.g., a coupon code or an event invitation) or for returning visitors who may no longer notice your onsite calls to action. A popup using an on-scroll trigger will appear once the user has scrolled through a designated percentage of the page. Use it to present relevant offers to users who have implied interest in a topic after spending time on the page (e.g., a free quote) or to catch the attention of returning visitors who may no longer notice your on-site calls to action. Popups that trigger on exit appear when the user moves to abandon the page. Use them for offers that can “save” a potentially lost conversion (e.g., a coupon code or shipping discount) or for offering free resources or collecting sign-ups that enable you to save a user’s details for future communications. Sometimes you’ll want your popup to appear after a designated time delay, typically between five and 20 seconds. Use this type of popup to present relevant offers to users who have implied interest in a topic after spending time on the page or for returning visitors who may no longer notice your onsite calls to action. 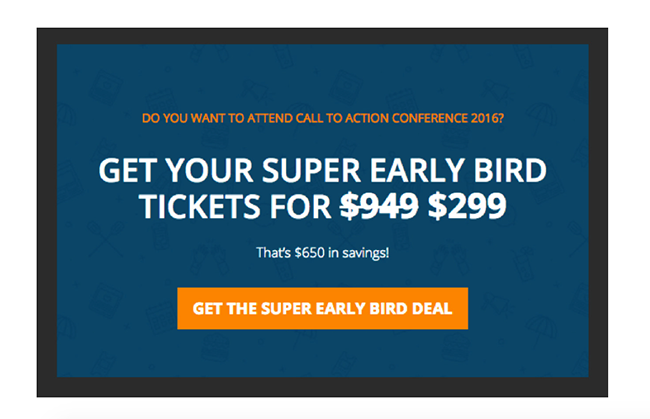 Psst: Unbounce Popups include all the above mentioned triggers plus on-click trigger. See the details here and start increasing conversions on your website today. That was a lot of information, I know, but as a marketer it’s your responsibility use your powers for good. And remember: A thoughtful approach to implementing popups benefits you and your visitor, because your goals are aligned. Have you had success with popups? Tell us about it in the comments!